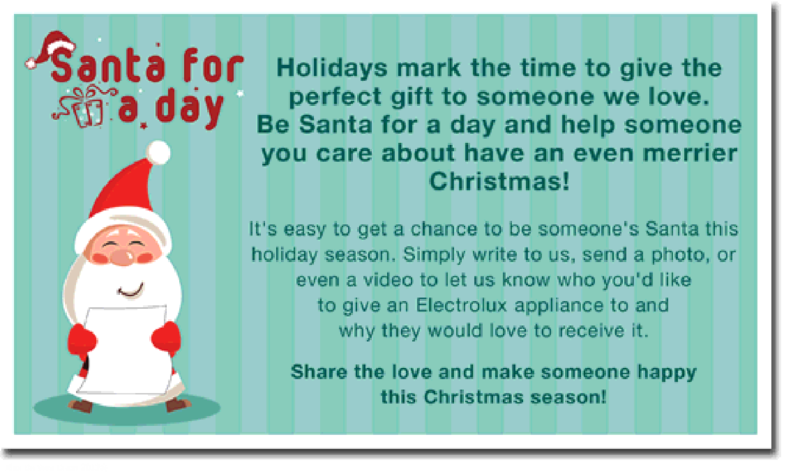 Home / appliances / christmas / contest / electrolux / electrolux philippines / home appliances / Santa for a Day / Yuletide Season / Give Electrolux Appliance This Christmas Day! 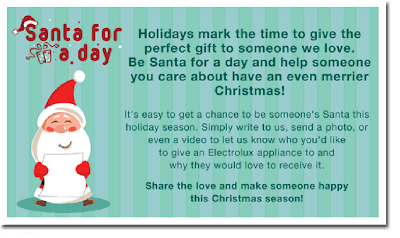 Give Electrolux Appliance This Christmas Day! Nothing could really beat the spirit of giving this Christmas season, that's why Electrolux Philippines made this gift-giving season more meaningful and more generous through their latest campaign called Santa For a Day. 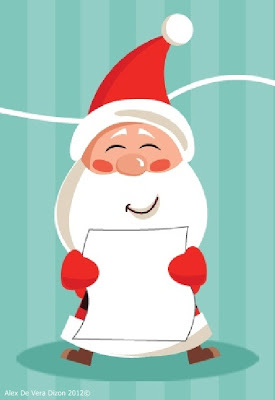 A yearly campaign that promotes the wonderful act of gift-giving, this year, three lucky persons will get a chance to be a Santa Claus to their love ones! From their wonderful range of home appliances - refrigerators, washing machine, cooking range, vacuum cleaners and many more - you can have the chance of giving one of these to you love one by just sharing you wonderful Holiday story to Electrolux Philippines. I've seen and somehow experienced the magic that Electrolux cooking range, and I'm honestly amazed as to how it works, how I really wish that I can have my own Santa so that I can start learning how to bake! Hahaha! 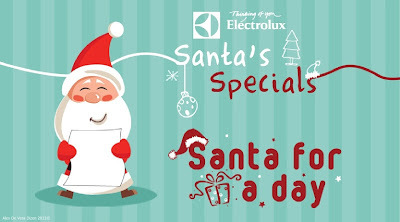 For those of you who are wishing to be the Santa of your love ones, all you need to do is visit Electrolux’s Facebook Page at www.facebook.com/thelittlewhitebook or their website www.electrolux.com.ph or follow them at twitter.com/ElectroluxPH. You'll be ask to answer the question, “What Electrolux appliance would you like to gift someone special this Christmas and why?” . You have to answer that in 500 words or less. Just a tip, if you want your story or letter to stand out, it'll be best to include a picture of video that will all more creativity to your creations. Of course, the more heartwarming, the better chance of getting picked, right? So, good luck to all of us and may we have a wonderful Christmas!